Use a natural frame within the image frame to compose your subject. Whenever a subject is composed it is framed by the photographer within the frame of the image itself. We see the four sides of the image area and try to fill that area as best we can with the subject. At least this is what most of us try to achieve. Another form of framing is to use your locality or a prop to isolate your subject better and create a natural frame within the image itself. By natural it means using a subject to frame another that would compliment or naturally interact with the scene. For example if you shoot a room interior from another room, you may use a doorway to frame the scene; a natural way of viewing the scene. In our example we have a scene taken in The Algarve, Portugal. Some of the beaches along this coastline have large cliffs that have been eroded over time, leaving lone pillars and caverns through rocks. In this image a cavern was used to frame the rock pillar. 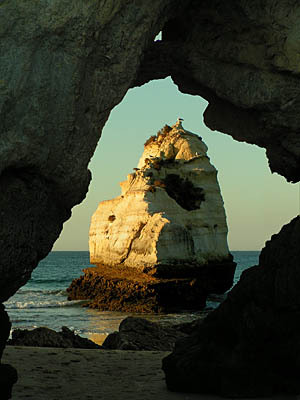 This frame has enhanced the image by giving it depth and hiding any unwanted elements to either side of the rock pillar. Also the deeply shaded rock in the foreground and the brightly lit pillar in the background have added contrast to the image. This example shows that when you are creating a frame for your image, it doesnt necessarily have to be square, it just has to help isolate your subject better. All of our courses show you how to perfect your compositional skills. Join one or more of our courses today. School of Photography Course Range.